Strawberry Shortcake for Breakfast? Sorta! Dunkin Donuts has newly released a fun limited edition flavor for their line of ground coffees- Toasted Almond and Strawberry Shortcake! 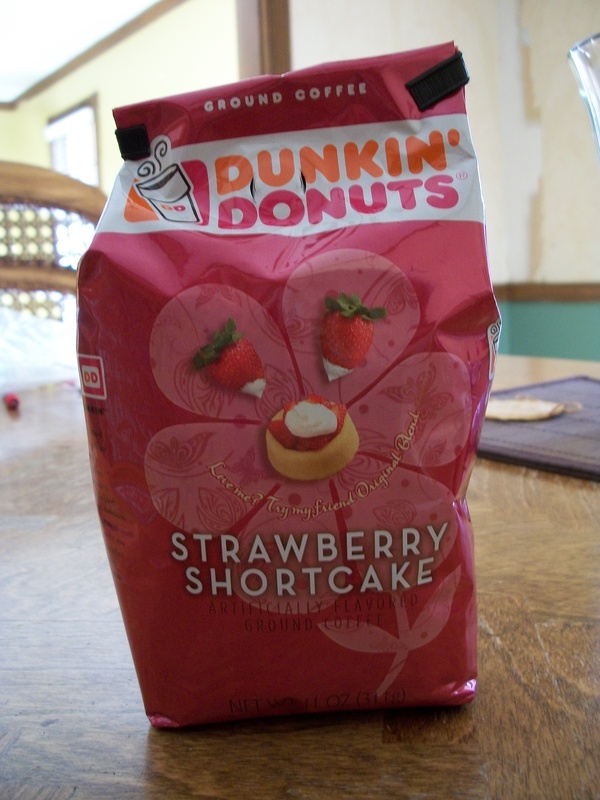 (If there are anymore, I do not know of them because I only saw these two flavors at Target).I was interested in the Shortcake bcecause I figured toasted almond was more easy to imagine taste wise and wasn’t as interesting compared to the pink prettiness of the Strawberry Shortcake. I picked it up, excited about what newness I’d experience upon tasting it. And I sniffed it a little. OH goodness! It was heavenly! So juicy, sweet and flirty to my nostrils! SOLD! I bought it for about $6.50-ish? at Target and when I first tried it, I literally wanted to spit it back out. (and yes, I did follow the instructions on the back) Slightly disappointed, I added Coffee Mate’s Italian Sweet Cream Creamer to it to enhance the overall flavor, and tone down the artificial strawberry taste. Sure, I’m sure some of you out there are saying “Well duh, of course it’s going to taste yucky! It is artificial!” But mind you, I have had coffees and even teas with strawberry flavoring that was magnificent. Anyhow, I tried it again, but decided to add slightly more sugar to it, specifically a 1/2 a teaspoon more,a teaspoon of Torani’s French Vanilla Syrup and to my relief, I ended up with a smoother strawberry flavor that seemed to blend better with the coffee. On the the last run, (my third attempt at Strawberry Shortcake Coffee perfection) I added 3 teaspoons of turbinado sugar, realizing this coffee has to have quite a bit of sugar added to it to reduce the slight bitterness of the strawberry flavor and tasted pretty decent. This coffee is not exactly pleasant unless 3 teaspoons or more of sugar (in my case Turbinado Sugar) is added to reduce the sharpness of the strawberry taste. This coffee doesn’t necessarily need Vanilla flavoring to be added unless you do indeed feel you have been shortchanged in the cream department. 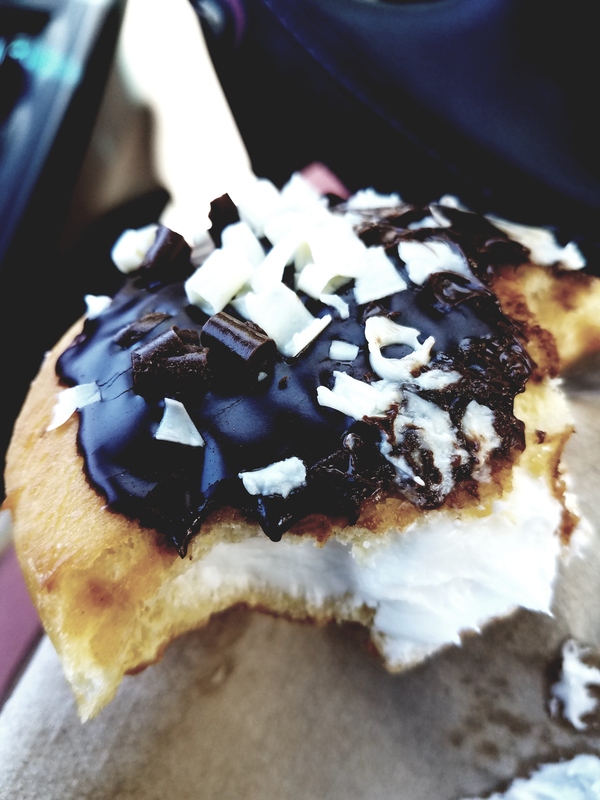 (On the package, not only does one see the berries and the fluffy sponge cake but also whipped cream) Sadly, the whipped cream flavor, or cream flavoring for that matter, fails to be tasted. Yes, I am literal with my flavors. If you promise or imply cream, I expect to taste the cream,too. Cons: Not very tasty unless I piled on the sugar. Not for persons who want to go easy on coffee that doesn’t have lots of sugar; may end up being too sweet for some of you out there. Oh, and adding vanilla creamer didn’t really do much. Can taste artificial and sharp to some taste buds. Not cheap,either. Coupon usage is highly recommended. Strawberry Shortcake Coffee Yumfactor: (Without the heaping amounts of sugar) 2 out of 5 tongues and a tastebud. (2.5 out of 5)(With the extra sugar helpings) 3 out of 5 tongues and a tastebud and a half (3.75 out of 5). It’s not too bad with the sugar. Liked it ? Didn’t? Then why not lave a comment?